Maddie has purple eyeshadow with a light purple/blue-ish top. She has a glittery layer that extends up the her eyebrows. She wears pink lipstick with no dot-shine. She has an adorable face!! Maddie’s earrings are teapots that are suspended by four little beads. 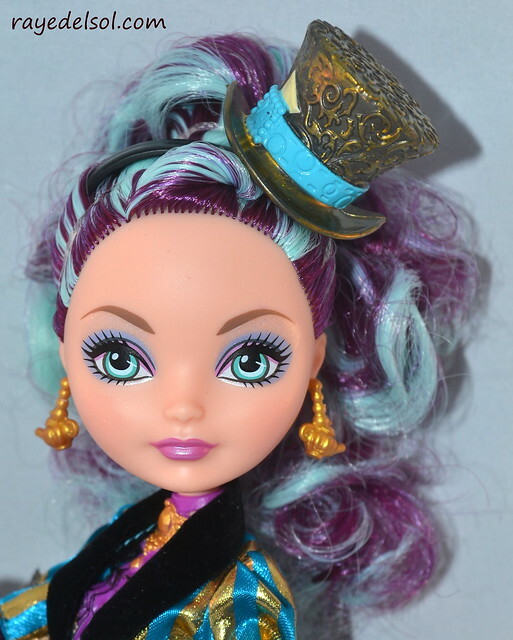 Maddie wears a large top-hat on a headband. 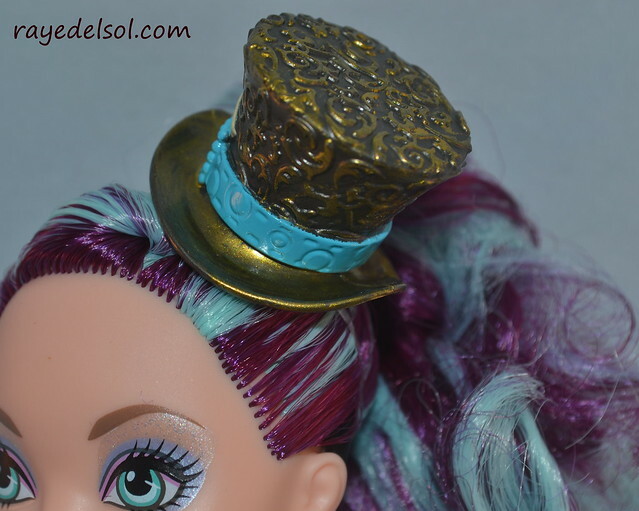 The hat features the little card on the band that is so iconic to the Mad Hatter. Maddie’s hair is a mess! It comes in one large ponytail. Maddie’s outfit is beautiful! If you are upset about details left out of Ashlynn or Cerise, blame Maddie. I can’t find a single thing that was left out or looked over. First, let’s look at this jacket. The jacket is 3/4 sleeve with blue and gold stripes. The collar is black and velvety. The jacket closes in a plastic button. 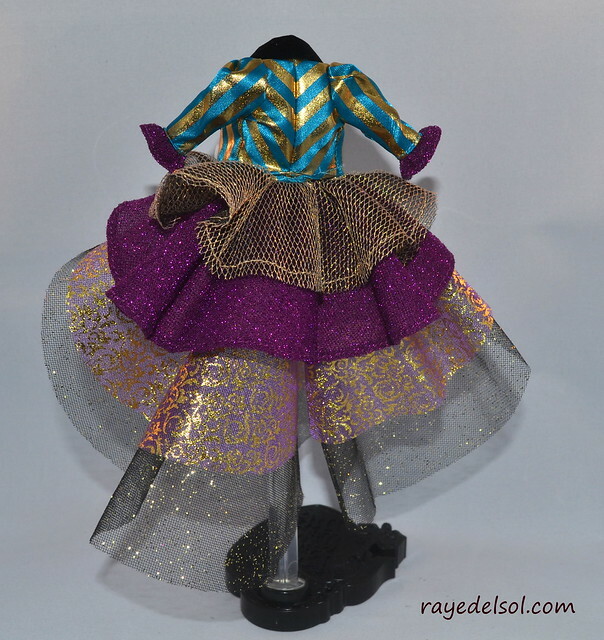 The jacket is where all of her ruffles are attached. She has four layers. The top is a gold mesh. The next is a purple sparkly opaque layer. This is followed by a sheer layer with gold filigree. Lastly is a black sheer layer with golden sparkles. I love the detailing on this jacket! 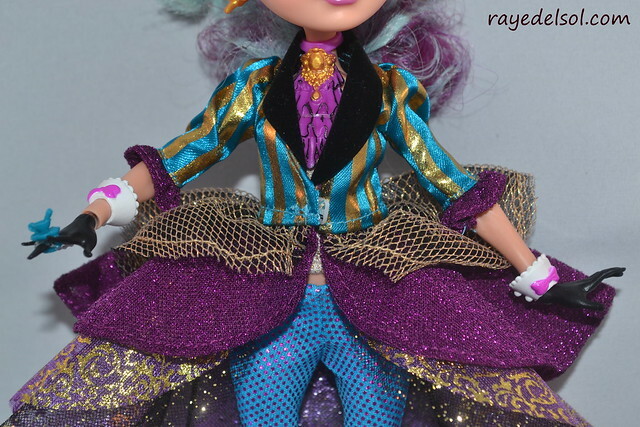 Under the jacket, Maddie wears a large purple necklace that looks like ruffles with a gold medallion. Maddie’s top is a sleeveless tube top. It is cream colored with golden threads. It reminds me of Holly’s top. It is soft like her top, too. Maddie wears capri-length blue pants with purple dots. Maddie wears white sheer stockings with golden dots all down them. Those aren’t stockings! They are knee-high socks! I don’t know why I expected them to go all the way up, but it makes sense that they stop at the knee. I couldn’t wear this fashion; I’d be fighting to keep my socks up. Maddie’s shoes are super detailed as well! 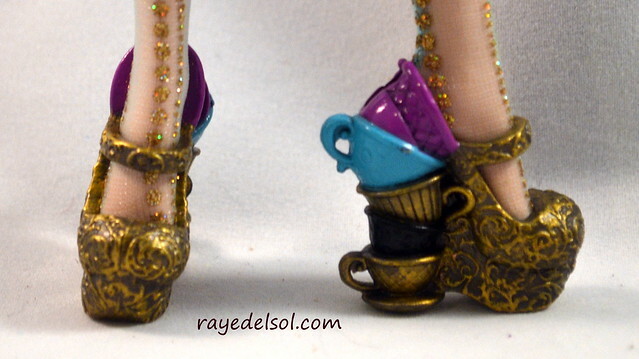 She has five tea cups as her heel! Maddie’s top is separate from her pants. Maddie’s ring is a tiny teacup with a spoon sticking out. Maddie wears two white cuffs with purple bows. Her purse is a tea bag with purple detailing and a little black string. 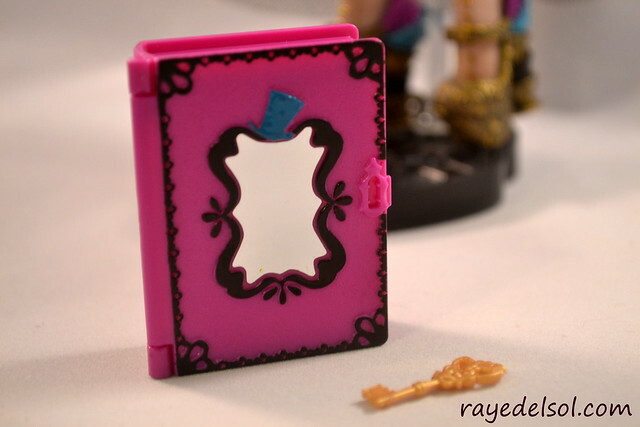 Maddie comes with a small Storybook of Legends with a golden key. 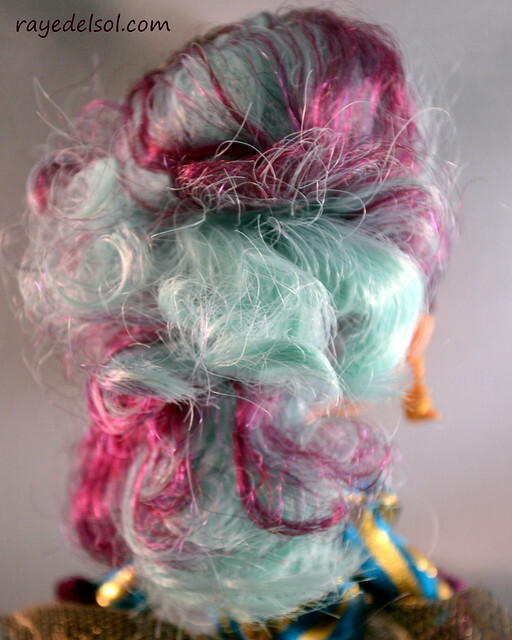 Her doll is super detailed! 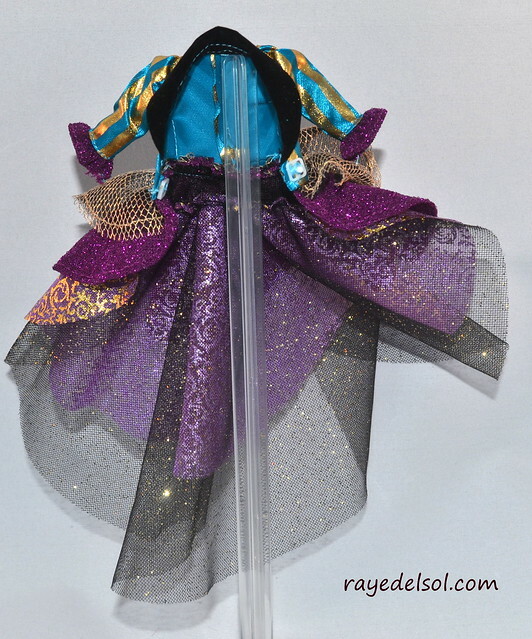 I LOVE Maddie’s Legacy Day doll. 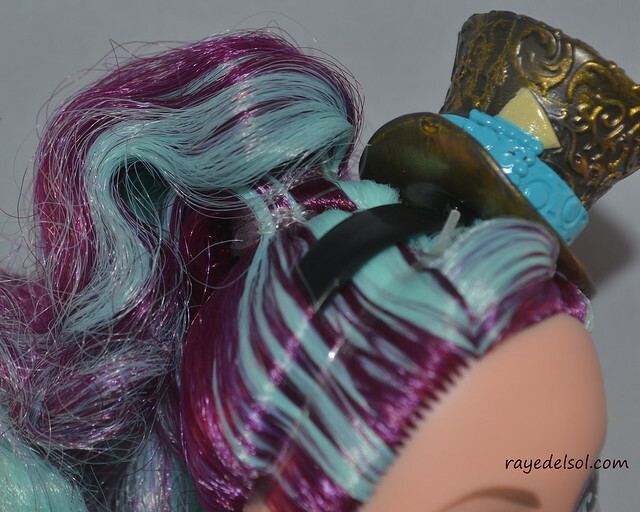 She’s such a great friend to Raven Queen and will make a great addition to your collection, especially if you have the Raven Queen Legacy Day doll! VERY HAPPY I’m not the only one with a dislike of Madeline Hatter. I feel they tried too hard on her character, and fell flat. Plus, Raven and her might have the worst relationship I’ve ever seen. It simply doesn’t make sense! Anywho, sorry for the ramble. I do, however, LOVE her outfit! It translated well from the webisode (unlike Cerise), and the colors I great. I’ve never liked her face-up. The first EAH doll I got was Madeline Hatter basic, and her face-up was always extremely off-putting. Great review, as per the norm. YAY! I’m so glad to see that I’m not the only one who dislikes Madeline. I mean really, I love all the other Wonderlandians (Lizzie (who’s my fave), Kitty, Bunny) but something about Madeline is just wrong. If she’s mad, why isn’t she just in an asylum or something like that? I think what’s wrong with Maddie is her skin colour. 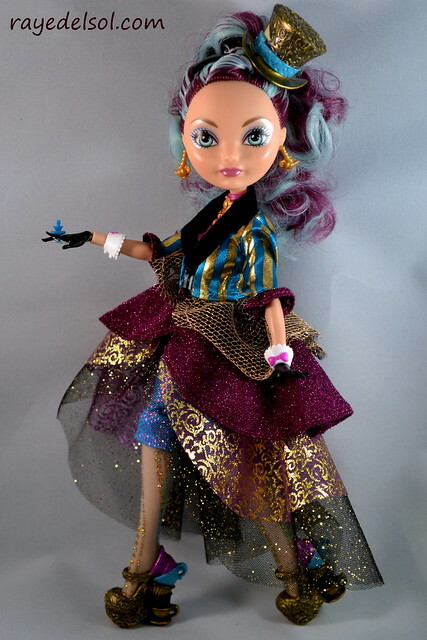 It’s somehow too tan to fit the colour scheme of her hair, clothes and accessories. I never really liked her either, but lately she’s been growing on me!